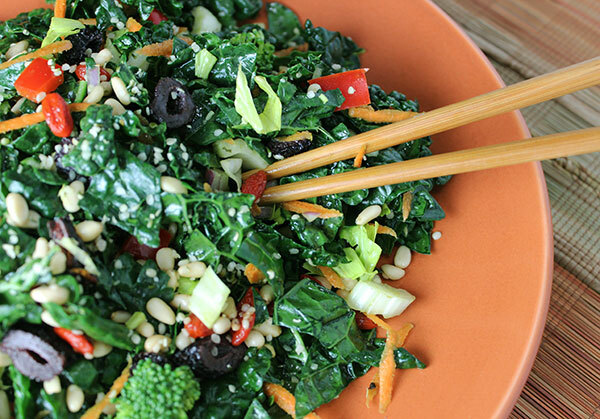 Here's a delicious kale salad recipe to give a try, whether you are new to the world of kale salads or looking to add another recipe option to your list. 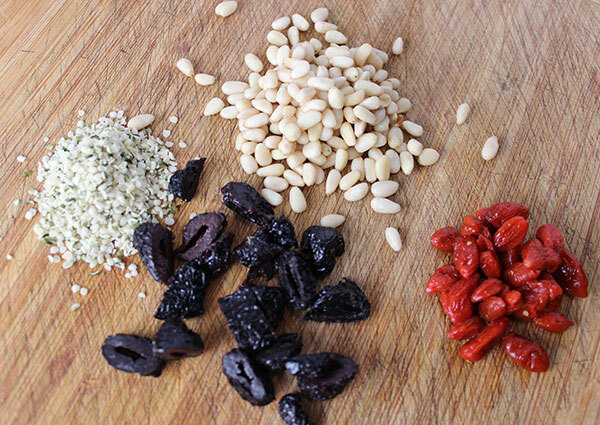 This one is our Italian spiced version blending in the flavor of pine nuts, olives and fennel bulb along with a few other superfood favorites. If you're searching for a light meal replacement or just need a side salad to go with a main entree, this recipe works well for both purposes. It also makes a wonderful potluck dish that is easy to make in advance and lends itself well to travel as a packed lunchtime meal. One of the best things about making kale salads is that they are not only quick and fairly simple to prepare, but also at the same time give you a big bowl full of fiber infused with energy promoting phytonutrients. 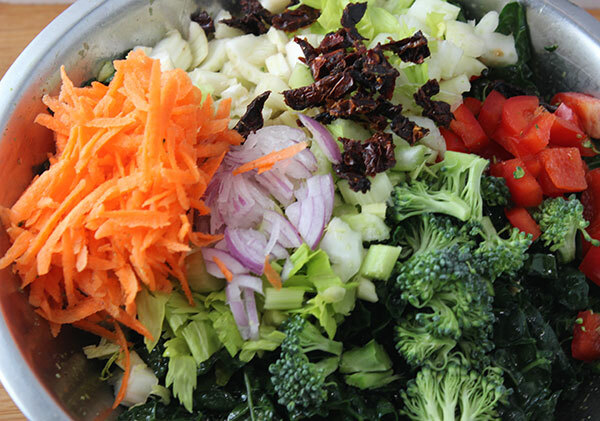 It is important to consume lots of raw fibrous vegetables in the diet on a regular basis to help cleanse the digestive tract, normalize bowel movements and eliminate the accumulation of undigested waste material potentially stuck in large intestine. Consuming kale and other leafy green vegetables is a great way to attain this objective. Kale is a cruciferous from the Brassica genus and is packed full of antioxidants, carotenoids and flavonoid substances. It is very high in iron, calcium, beta-carotene, Vit. C and Vit K. as well as chlorophyll, a health enhancing natural detoxifier, anti-inflammatory and alkalizing food source. A number of past and present studies additionally confirm that large portions of cruciferous vegetables added to the diet can significantly help to lower cancer risk, often displaying chemoprotective properties that reduce the body's susceptibility to carcinogens. 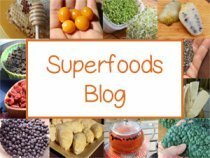 Cruciferous vegetables or crucifier's, on the flipside, have also been shown to contain certain enzymes that may suppress thyroid gland function and interfere with iodine uptake for some individuals. Crucifer consumption is therefore not normally recommended for those with iodine deficiency or an under-active thyroid. This is especially the case when consuming raw kale in large concentrated quantities, as would be the case when green juicing or eating a very big bowl of raw kale salad. 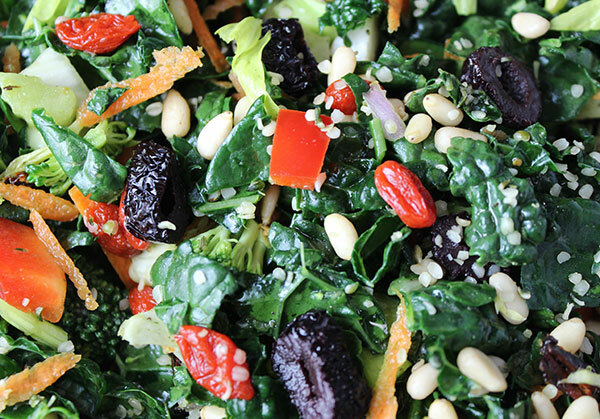 Who Invented the Raw Kale Salad? 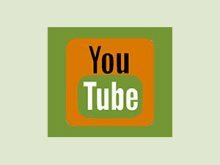 The concept behind using raw kale as a lettuce replacement in salads was primarily an invention that came along with the growing popularity of the raw vegan diet in the early 2,000's. Greens, being a main source of protein for those who don't eat meat or dairy products, are often consumed in large quantities on a regular basis by those adhering to a raw diet. Blending kale up in a green smoothie, green juice or raw soup is one way to accomplish this objective, the other is to make a raw kale salad. Although the average kale salad has taken many different culinary paths, there are a few basic rules that still hold true for making the perfect kale salad recipe. 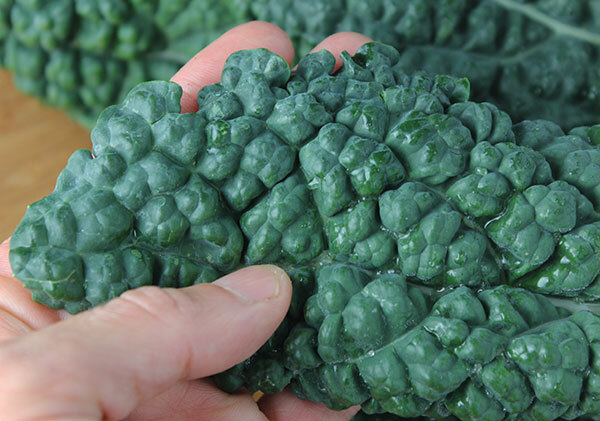 1) Choosing Your Kale Leaf - Although you can use any kale leafy variety, like curly kale and red russian kale, we have found lacinato kale, or also called dino kale, to be a better choice texture-wise. When making kale chips, however, you want to use a ruffled leaf kale, like curly kale. 2) Removing the Kale Stems - It is best to remove the kale ribs or stems, which tend to be very thick, bitter, harder to chew on and digest. The kale ribs are found in the center portion of the leaf and when folded in half lengthwise can be easily sliced off and saved for juicing recipes. 3) Chopping the Kale - It is nice to chop your kale into bite-size pieces rather than larger leafed sizes. Kale is easier to chop by hand if you roll the leaf and cut it horizontal and then lengthwise. The other option is to use a food processor and place in semi-chopped kale, pulsing for a few seconds for the desired size pieces. Food processing the leaves can get a bit tricky, however, because you don't want to overdue it. 4) Using Vinegar or Lemon Juice - Raw kale can be thick and tough to chew on, not to mention hard to digest for some people. Acids like vinegar or any kind of citrus juice help to soften and tenderize the dense leaf fibers and make it more palatable to eat and easier to chew. The addition of salt also helps to achieve this goal. It is also important during this step not to over-dress the salad as it will make it too limp and possibly soggy. 5) Massaging the Kale - After you have chopped the leaves, it is a good idea to briefly and gently massage the kale and dressing together with clean hands. You can do this by grabbing a handful of leaves and scrunching them slightly between your hands. Repeat this several times. This helps to incorporate the mentioned salt and acid necessary for creating a nice texture. 6) Allow to Marinate - The best kale salad recipe is one that is allowed to sit for at least 30 minutes or longer. This helps to soften the leaves and permits it to develop a sweetness as it marinates. Make the vinaigrette dressing in a blender or whisk together ingredients by hand. 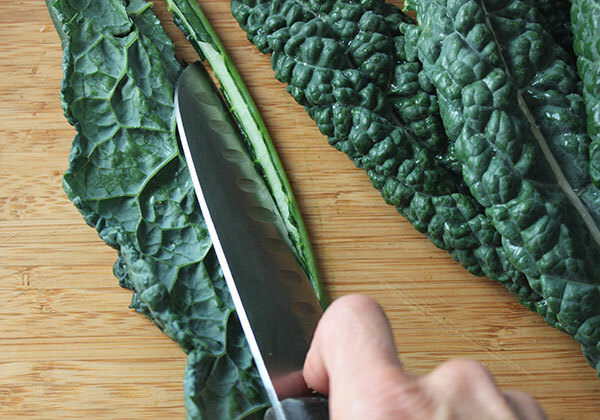 Slice out the kale ribs from the center of the leaves. Roll the leaf and hand chopped into bite-size pieces or use a food processor. Place in a big bowl and toss with dressing, massaging the kale with your hands for a few seconds and set aside. Chop, dice and slice the other vegetables and mix into your marinating kale. 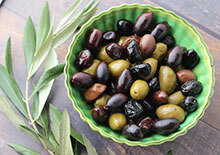 Toss in the olives, hemp seeds, pine nuts and goji berries. Allow to marinate for 30 minutes before serving. 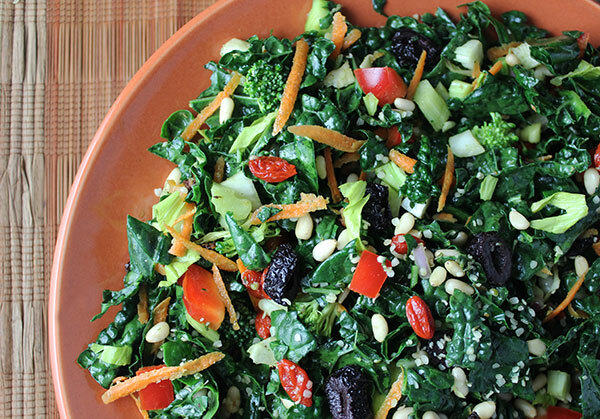 This kale salad recipe makes 4 small salads or 2 big ones. If you are making it in advance or refrigerating for over 8 hours it is good to add half the amount of dressing and the other half before serving. This is to ensure it doesn't get to limp. You can also top this recipe with spirulina powder, seed cheeses or onion sprouts as an alternative to raw red onion. 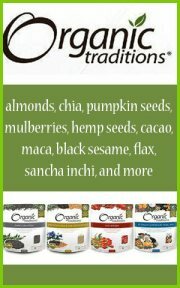 Visit our raw vegan recipes page for more raw vegan desserts, drinks and entrées.